Yet another release has come from New Rules Entertainment, after Shannel's Cold War. This one though is by That Travolta Guy. Allow to give you a brief history lesson about That Travolta Guy. He started rapping in 2010 under the rap monicker Pheonix Pro and was part of a rap group known as Team BP which separated in 2011 then some of the members formed Squad Medicine which is made up of rappers and producers all under New Rules Entertainment. 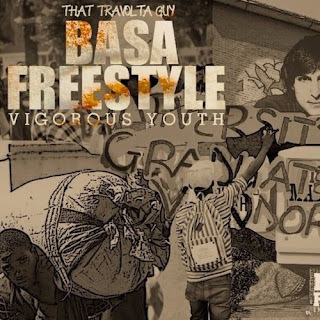 Right now he's working on an EP titled Vigorous Youth and Basa Freestyle happens to be the first single off that project. Basa talks about the lack of employment in Zimbabwe and how people go around putting foods on their plates as graduates baby-sit their degrees at home. It also preaches some hope for a change to the situation. On the second verse he switches and talks about hustling in the streets. Other tracks from the EP will include Sandinetse, Good Together and Akuzunza. Features will include Vadda, King Kush, FaeAlice and Reign.